With minimal sleeve notes or production details, along comes a brand new CD release of Marley dubs issued previously via download only. With eleven tracks including ‘Lively up Your Dub’, ‘Smile Jamaica Version’ and ‘Waiting in Vain Dub’ it’s an intriguing take on some of the classic songs of the Marley era. Of course this is not the first opportunity to savour some key Marley tracks in a dub style: an early release of pre-Island tracks like ‘Bob Marley Original Dub’ provided raw instrumentals devoid of the vocal channel, more properly described as instrumental ‘versions’ rather than ‘dubs’, but their primitive power is still evident through a suitably cranked-up sound system. The 12” vinyls of Marley singles provided some excellent dub renditions, notably on ‘Buffalo Soldier’, a dub whose bass register reaches so low as to alert any seismic measuring equipment in the vicinity to register some imminent catastrophe: you can get a worthwhile 12” Buffalo dub on the later CDs of ‘Confrontation’ but sadly not the bass-led B side of the 12” single. And – seeing as how we’re getting a bit obsessive about this – on the second CD of the double-CD release of the zillion-selling ‘Legend’ there are some very decent alternative remixes, specifically the ‘extended version’ of ‘One Love/People Get Ready’, possibly the best place of all to start with all this Marley dub stuff. So, if the release of ‘In Dub Vol 1’ is not the first such attempt, what is it? Well it’s the first album-length release of Marley dubs on a major label, and it does have an original approach to dub construction. This makes it interesting but also uneven. ‘Roots, Rock, Dub’ Kicks things off cleanly and keenly, skanking guitar, fragments of backing vocals preserved, yet it lacks urgency and sounds more like a rather languid backing track than an assertive dub. The same could be said of the ‘Jamming Version’ included here. ‘Is This Love Dub’ comes in much more strongly, and could conceivably have been sequenced to get the album under way more convincingly: lead vocals fading in and out, echo, repeat, with percussion hammering out the beat somewhere far away, a lot going on and a lot more interesting than the way the album began. ‘One Love/People Get Ready Dub’ is similarly impressive. 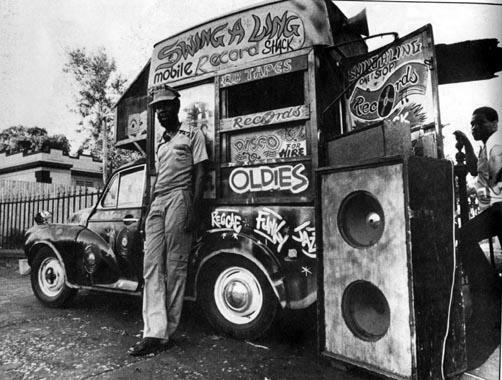 ‘Forever Loving Jah Dub’ takes the lead role of the dub bass seriously, while ‘Lively Up Yourself’ retains more of the original vocal than some of the other tracks although tending to get too busy with studio effects and old-fashioned speaker-to-speaker twiddling than is strictly necessary. ‘Three Little Birds Dub’ sounds, engagingly, like something from the dawn of reggae, no doubt due to the classic-era instrumentation. ‘Crazy Baldhead Dub’ is darker and more interesting while ‘Waiting in Vain’ seems even bleaker than the original when stripped down like this. ‘She’s Gone Dub’ includes much of the original vocal before breaking off into great old-school version/dub style while the album concludes with ‘Smile Jamaica Version’ and its characteristically muddy production sound. There is some credit due here for not simply releasing a routine ‘dub’ of Marley songs by just removing the vocals, fading a couple of instrumental tracks in and out, and adding a bit of echo and reverb here and there. By trying do more it inevitably succeeds a little more convincingly with some tracks than others.